Not one to let myself only be all-consummed with finding suitable recipes for turkey and side dishes, I've also decided that for my thanksgiving dinner I will create some cute turkey place holders. I'm torn between two but think I'm leaning more towards the first, depending on how much time I have. Using this template you fill out trivia questions (samples found here - U.S. based questions though) on the turkey's tail feathers. This works so well for my trivia-crazy family. My dad used to always read us the trivia questions from the Toronto Star's Sunday paper and it would be a race to see who could answer the most correctly. 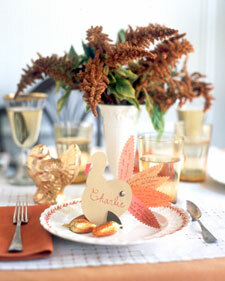 Second option is for a less interactive but more eye-appealing turkey. 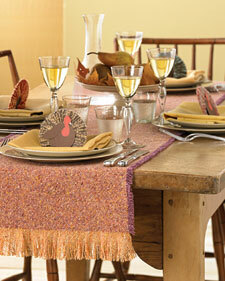 You'll need a supply of crafts and this template that will leave you with a pile that resembles this. Following these instructions, you should hopefully end up with something that looks like this! Upon closer inspection of the length of time it will take to make these and the fact that the trivia option is way more fun, I'm going with the first idea! Let's hope it actually pans out.